IndependentFilm.com|VIDEO: SUNDANCE FILM FESTIVAL Josh Hartnett, "Resurrecting the Champ"
home > film festivals > watch film festival video > video: sundance film festival josh hartnett, "resurrecting the champ"
VIDEO: SUNDANCE FILM FESTIVAL Josh Hartnett, "Resurrecting the Champ"
Josh meets with independentfilm.com to talk about his new film. Josh plays a reporter who discovers a homeless man who turns out to be a former boxing legend. 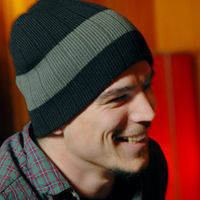 Josh Hartnett of the Sundance Film Festival Feature "Resurrecting the Champ". Josh meets with Corey Boutilier of independentfilm.com at the ESPN Sports Zone bar held during the Sundance Film Festival to talk about his new film. Since Josh plays a reporter, we talk a bit about modern journalism. (FYI, our Martini glasses were filled with water!) Photos by John Mazlish.